Despite the increased interest in the use of evidence-informed practice within schools, research suggests that the majority of teachers are not using research to inform their teaching practice. Research from the Sutton Trust indicates that a minority of teachers (45%) are using research to inform their teaching, with only a small minority of teachers (23%) using the Education Endowment Foundation’s Teaching and Learning Toolkit. Morever, other research undertaken by the NFER - Nelson, Mehta, et al. (2017)- suggests that research evidence is not playing a major role in teachers’ decision-making when developing their classroom practice, relative to other sources. So given the potential magnitude of the challenge, it makes sense to look at the science of behaviour change - and the work of Michie, Van Stralen, et al. (2011)and Michie, Atkins, et al. (2016) and their Capability-Opportunity-Motivation Behaviour( COM-B) model of behaviour change - to see what help it can provide evidence-informed practitioner who is interested in bring about changes in teachers’ practice within their school. Indeed, interest is already being shown by the Education Endowment Foundation in the COM-B model and how it can be used to think about interventions could be designed to increase their chance of bringing about behaviour change (Sharples, 2017). · Capability - the individual’ s psychological and physical capacity to engage in the activity concerned. It includes having the necessary knowledge and skills. · Motivation - those brain processes that energize and direct behaviour, not just goals and conscious decision-making. It includes habitual processes, emotional responding, as well as analytical decision-making. However, this only provides a very brief of the model and its components. 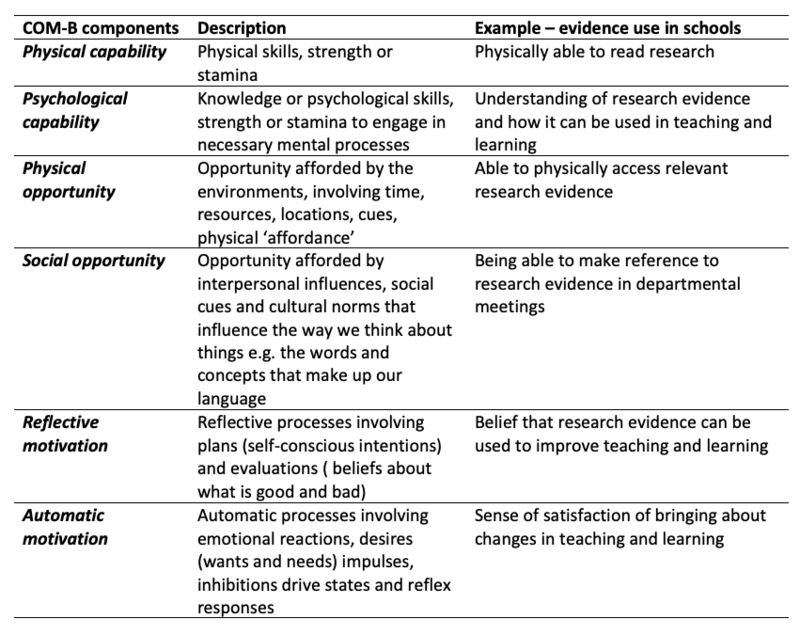 Table 1 provides definitions and examples of the components of the COM-B model as applied to the use of research evidence in schools. However, it needs be emphasised that the implementation of those examples alone may not be enough to bring about the desired behaviour change. Indeed, multiple activities or changes in each component may be requited. Indeed, research by Langer, Tripnet, et al. (2016)on the science of using science in decision-making would suggest that interventions that only focus on only one or two of the three components are highly unlikely to bring about greater use of research evidence. Indeed, future blogs will use the COM-B model to examine the various actions which can be taken to support behaviour change. In doing so, we will be looking at the outer rings of the Behaviour Change Wheel i.e intervention functions and higher level policy. Langer, L., Tripnet, J. and Gough, D. (2016). The Science of Using Science : Researching the Use of Research Evidence in Decision-Making. London. EPPI Centre, S. S. R. U., UCL Insitute of Educations, University College of London. Michie, S., Van Stralen, M. M. and West, R. (2011). The Behaviour Change Wheel: A New Method for Characterising and Designing Behaviour Change Interventions. Implementation Science. 6. 1. 42. Michie, S., Atkins, L. and West, R. (2014). The Behaviour Change Wheel. A guide to designing interventions. 1st ed. Great Britain: Silverback Publishing. Michie, S., Atkins, L. and Gainforth, H. L. (2016). Changing Behaviour to Improve Clinical Practice and Policy. In Axioma-Publicações da Faculdade de Filosofia. Sharples, J. (2017). Untangling the ‘Literacy Octopus’ – Three Crucial Lessons from the Latest Eef Evaluation. Education Endowment Foundation Blog. https://educationendowmentfoundation.org.uk/news/untangling-the-literacy-octopus/.